Wish You All A Happy Valentine's Day! A Little Music For Those In Love & Those Searching For Love. "The only thing you sometimes have control over is perspective." February, the month associated with the sign of Aquarius, literally meant the month of purification. for in Latin "February" means purification and "arius" means "about". .
Rev. Daniel Chesbro extends an invitation to you to receive a sacred energy boost with the Order of Melchizedek. There are many paths to God, but the basis of all true spiritual work is Love, Unconditional Love, and we all come from that source. 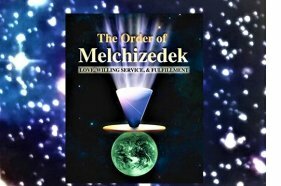 The Order of Melchizedek does not discriminate by race, age, gender, religion, life style, etc. but is an unconditional love response to world service. Since early 1986 when Dan received guidance to begin “calling the Priests” he has been teaching and performing ceremony for thousands ever since. Everyone is welcome to Register. Learn what Reiki is, how it heals. In class we will review the traditional Reiki History and Reiki hand positions used in a session for yourself and others. The class combines lecture, discussion, attunements, meditations and experiential practice in a well organized relaxed atmosphere. Enter a place of healing and freedom from emotional scars which you may still continue to suffer from the past. Emotional scars from this life, past life or from our lineage and ancestors. Learn and understand where they come from and how to clear them, tapping into a new system of belief. Our ancestors used many systems to do intuitive readings. Join us for our last class this month of the seer's series an experience and learn techniques of gazing & reading with Rock & Water. Hydromancy is the knowledge of divination that involves the use of water to bring messages, predictions and psychic messages. We welcome you to come and relax in a Sacred Space of harmonic Sounds with Sacred Gongs, Tibetan Bowls, bells, drums, rattles, flutes, chanting and energy galore. In this one day intensive class we explore and learn the techniques of the crystal Vogel Wand which emits a vibration which extends and amplifies the power and grasp of the user’s mind. In this class you will learn the history of the wand & learn how to use your wand learning to charge, activate it and learn how the wand can bring harmony and balance by renewing energies in the etheric and chakra fields. A class for all healers, Reiki, Shamanic, Crystal & Energy workers. LinDel will begin the evening by guiding us through gentle Qigong movements and simple sounds to calm, heal and open the Heart while Judith will play her Tibetan singing bowls. Your invited to the MedicineWay Healing Circle. This month we will be working with the Black Madonna, our totems & Mother Gaia. Your welcome to a sacred space to learn healing methods and experience remedial inner and curative union. It is always a time to reflect and sometimes the unseen needs to be acknowledged. In this workshop we will play with different sounds, rhythms and overtones. Experience how vibration can move through the bodies energy fields, how blockages are removed and how we can restore, align, and awaken the 5 bodies. We have a tool that can extract energies no longer needed in the body and bring more fluidity to our blood and DNA. Open Now for Registration MedicineWay (Shamanic) Apprenticeship Program, Crystal Healing Certification I, II & III and Being in Wakeful DreamTime with Irma.